Before his accident, Tony was working as a lifeguard and pool manager, as he had done in previous summers. He had just finished high school. It was August, just weeks before he planned to start college. Early one morning, he and another lifeguard took the day off and headed out to the beach for a day of body surfing. He explains, "You swim out, turn around, watch for a wave, and then swim towards the shore, and you put your body out flat on top of the wave, and you ride it in." The morning passed pleasantly, and soon it was nearly lunchtime. One more ride before lunch, he thought. He picked up a "really good wave," but as he climbed on top, it "broke funny, like a shear wall." The mass of water slammed him to the ocean floor, landing him on the crown of his head and compressing his spinal cord. When Tony emerged from acute rehabilitation six months later, paralyzed from the neck down, his future was uncertain. His father was working two jobs, and his mother worked full-time at a grocery store. His parents managed to keep working while caring for him, but the financial burden proved insurmountable. Without Social Security disability benefits and Medicare, he believes the family might well have gone bankrupt. Tony's disability payments allowed him to buy a computer and teach himself how to use it. He gradually leveraged his computer skills to rejoin the workforce and leave disability benefits. This experience inspired him to help other people with disabilities go to work as well. 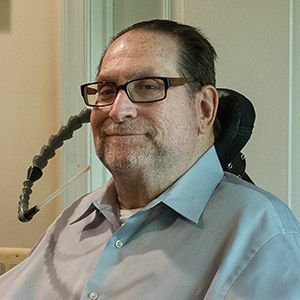 Later, when a secondary illness once again prevented him from working - "the dark days when I wasn't quite sure what I was going to do" - Social Security offered a ray of hope. Knowing that he could return to work when he was able, he went back on disability benefits until his health improved. Today, he remembers that Social Security was there for him - twice - when he needed it.